An overhead shot of the opening ceremony (photo by David Stobbe). With a mix of culture, tradition and ceremony, including a performance by Juno award-winning artist Susan Aglukark, the U of S has paid tribute to the past, while opening the doors to the future. 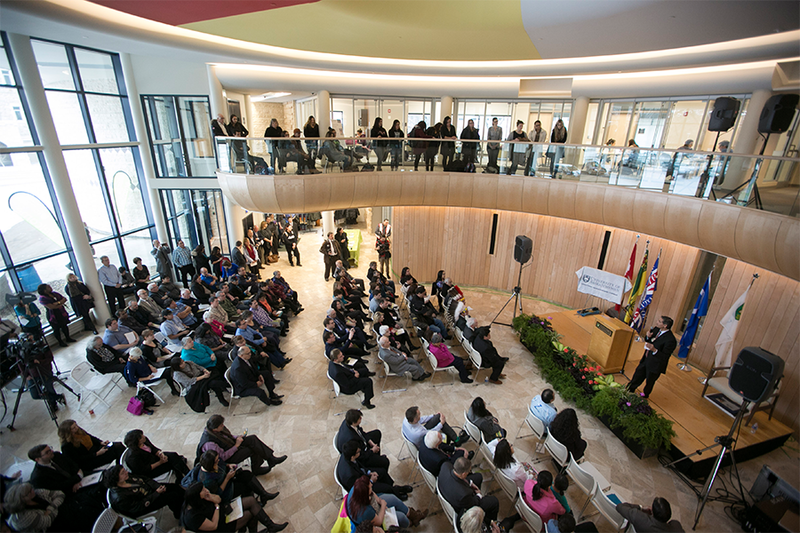 On Feb. 3, dignitaries from around the province and across the country took part in the long- awaited grand opening of the Gordon Oakes Red Bear Student Centre. The drumbeats of an honour song filled the meticulously designed curves of the centre's central hall as hundreds in attendance watched a procession of speakers and special guests file in to start the program. "The centre has been in progress for many, many years, close to two decades now," said Peter Stoicheff, U of S president. "Lots of faculty, lots of students, lots of administrators, including my predecessor Peter MacKinnon, were instrumental in starting this." Designed by Douglas Cardinal, a renowned Métis and Blackfoot architect, the 1,884-square-metre Gordon Oakes Red Bear Student Centre is a "building that symbolizes reconciliation and I like to think that when you open the door and come into this building you are unlocking the door to reconciliation," said Stoicheff. "The U of S is proud to be a place of learning for over 2,200 Aboriginal students and an increasing number of Aboriginal faculty and staff. This student centre is a three-dimensional expression of the university's aspirations to be home, however, to many more," said the president. U of S Chancellor Blaine Favel, a student in the U of S Indian Teacher Education Program in the ‘80s, said "if we had a building like this on campus 20 years ago you would've had a lot fewer dropouts probably and you'd have a higher achievement level. "When we were young students coming here, we felt very much alien and very far from our homes and communities and cultures," said Favel. Housing the Aboriginal Students' Centre, the Aboriginal Initiatives Office and the offices of the Indigenous Students' Council and the Indigenous Graduate Student Council, the centre "is a bridge between the communities and university. It's a place where the students can come and mix and mingle with other students, find mentors, find tutors. It's also a place where non-native students can come learn about the culture. It's a beautiful space. It is an important symbol of reconciliation for the province," Favel said. Among the speakers— which included Stoicheff, Favel and Cardinal—were MLA Paul Merriman, Treaty Commissioner George Lafond, Saskatoon Tribal Council Chief Felix Thomas, U of S Students' Union President Jack Saddleback, Elder Larry Oakes, the son of the late Gordon Oakes, and National Chief of the Assembly of First Nations Perry Bellegarde. "We've heard the calls to action from the Truth and Reconciliation Commission, 94 calls to action," said Bellegarde, adding that through this building the U o f S is "not only talking about it, but actually do something about it." Bellegarde said that Gordon Oakes talked about how education is like a team of horses, pulling together and working in balance. "On one side, he'd tell students (to) carry on with math and science and university … Equally as important are your languages, and your ceremonies and your traditions and who you are and where you come from," Bellegarde said. "So as Indigenous people who walk through those doors, when you put those together you are strong." Echoing Bellegarde's sentiment on the importance of education, Favel said, "The enemy of racism is knowledge and understanding, that leads to tolerance. What I would like to see taken away for non-native students is just an appreciation of how wonderful and beautiful our culture is … Gordon Oakes, who we're naming it after, was a profound leader, he was a holy man, he was a political leader and just very much represented the best of our peoples, so it is appropriate that this building is named in his honour." "To me this is a great day for this campus and for Aboriginal students on this campus," said Stoicheff. "It's a sign of respect for them and it's a sign of the university's aspirations for them going forward, a sign of the university's commitment to be the best place it can possibly be for Aboriginal students and their communities in the future." Inuk musician Aglukark closed the ceremony with a three-song performance, including O Siem, a song about family and togetherness.